When a friend asked me recently for advice on buying an e-reader, it got me thinking about just how much I rely on my iPad for reading these days. Books, newspapers, magazines – nearly all my reading is done on this device. Instapaper is a service which allows you to save articles for reading later. I use it most often to save longer articles I don't have time to read at the moment. It comes with a range of plugins and apps which allow, for instance, you to save an article from your desktop computer then read the article later on your iPad. Articles are presented 'clean' and very easy to read. I prefer Instapaper but there are alternatives including Pocket and Apple's built-in Reading List. 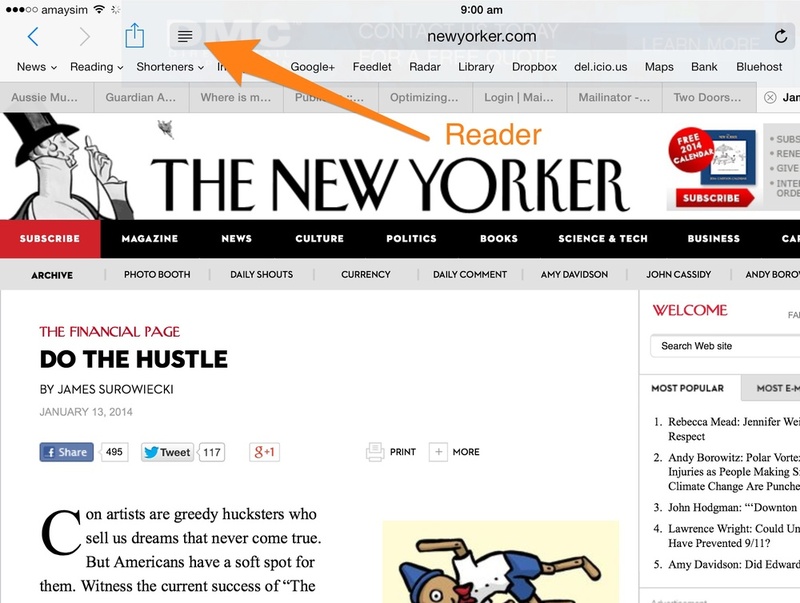 RSS readers are another way of collecting articles for when you have the time to read them. Want access to more ebooks without forking out the big bucks? Try your local library. Most libraries now have selections of ebooks available for borrowing, often via the Overdrive reading app. At my library, ebooks can be borrowed for a two weeks, much like physical books. The only difference is that at the end of the loan period, the ebooks delete themselves – something they haven't worked out how to do with paper books yet. Many predicted the demise of traditional magazines in line with that of newspapers, but in fact many magazines are still selling well. That doesn't mean you need to buy dead-tree versions. Zinio is a service which makes a huge number of magazines available online. Complementary apps allow you to download and read full versions of your favourite magazines on your iPad or tablet. And as an extra bonus, many libraries have these digital magazines available for 'borrowing' – but without the auto-delete penalty. Have your own tips or questions about reading on a tablet? Please add them in the comments below, or on our Facebook page. Newer PostColor or colour? Are you writing your English right?